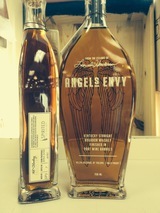 Angel’s Envy Kentucky Straight Bourbon is finished in port wine casks for an award-winning spirit. They guide each batch’s conditioning, blending their handcrafted bourbon in small batches of 8 to 12 barrels at a time. It’s typically aged for up to 6 years. While they lose about 5% of the spirit each year to evaporation, or “the Angel’s Share,” what’s left behind after they're done is truly worthy of envy. Once it’s deemed ready, they finish the bourbon in ruby port wine casks, which adds subtly distinct flavor nuances that enhance the whiskey without challenging it. Their port finishing process lasts between three to six months, depending on taste. They use 60-gallon ruby port barrels made from French oak and imported directly from Portugal. This creates a whiskey of unprecedented smoothness, sweetness and balance. A beautiful, mouthwatering newcomer to the whiskey scene. Named for the "angel's share," the portion that evaporates from the barrel during the aging process, this golden amber spirit is finished in Port barrels, which explains those juicy red-fruit notes that slide into the long finish. Look for orange peel, vanilla and roasted nut flavors, too.